Organic farmer Alison Howard will speak about organic farming at the annual Agriculture and Environmental Law conference held Friday, November 17, 2017. 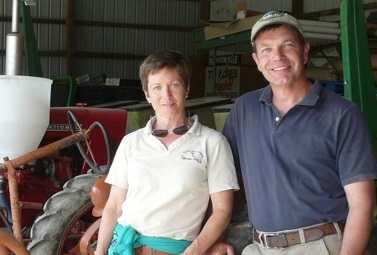 Howard’s farm is in Millington, Maryland where she and her husband, Luke, farm a total of 600 acres. Fifty acres are designated for growing vegetables, including cabbage, kale, watermelon and squash. The remaining 550 acres are used for growing grain varieties, including corn, wheat, barley, and soybeans. The farm also raises poultry year-round. “My husband and I like the challenge of farming, the environment and the physical environment of being out outside,” said Howard. “We like the lifestyle.” They chose to be on the Eastern Shore based on its affordability and location near many markets and populated areas. Organic farming was the only type of farming Howard had any familiarity with when she and her husband started the business in 2002. Howard studied sustainable agriculture at the University of Maine. She loved plants, chemistry, and soil, and always knew she wanted to be involved in agronomy at some level. While at college, she learned about organic farming practices. Her husband grew up on a dairy farm. “On spreadsheets, the organic model looked better for us and it had better end prices,” said Howard. As organic farmers, they need to have all the inputs on their farm, including seeds and fertilizer, certified in order to be considered organic. “I would definitely work with a certifier right off the bat. Don’t wait three years to start working with them,” said Howard. The annual Agriculture and Environmental Law conference will be held Friday, November 17, from 8 a.m. to 3 p.m. at the DoubleTree Hotel in Annapolis, Maryland.